If you watched last night’s State of the Union Address President Trump gave, a week later than the original schedule due to the government shutdown, you surely don’t need to spend much time this morning being told what you saw – and if you didn’t watch it, chances are you’re less than interested in a review of it. So I’ll be brief with this one. CBS News offered an instant poll following the speech which found 76 percent of the viewing audience approved of it. That’s not a surprise, as this was Trump at his best. The first third of the State of the Union was replete with lines it was virtually impossible for the Democrats not to applaud – touting undeniably impressive economic statistics on job creation, unemployment, labor participation and other things. But on many of those lines the Democrats, highlighted by a large contingent of their female House caucus dressed in white out of “solidarity” (with what, we’re not sure) failed to applaud. And that became a major theme of the speech. Trump would tout a policy aim or accomplishment, receive enthusiastic responses from the Republicans, and get a conspicuously surly response from scowling women in white suits in the heart of the Democrat side of the aisle. 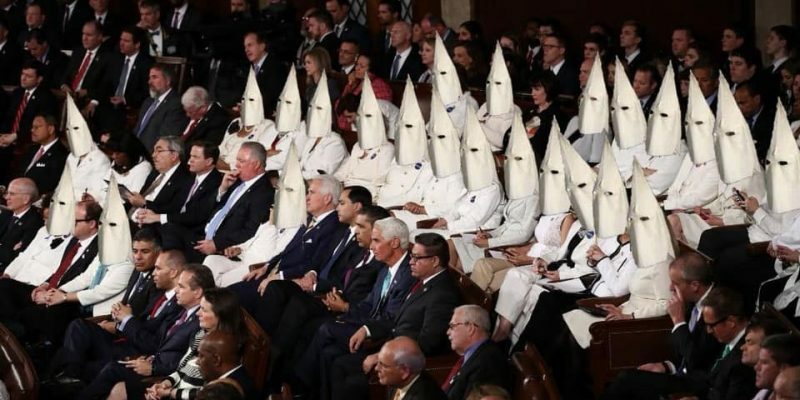 Halfway in, it hit me – while Facebook filled up with the reaction that Democrats wearing white en masse is a rather unfortunate and ironic historical analog – that this was the Kitty Kat Klan, the newest iteration of that party’s bitter-end resistance. They can’t abide private sector job growth, they won’t stand for the unborn, they have little use for unity or compromise and their enmity for Trump is boundless – as they showed at the end of his speech, when many of them literally ran from the chamber. Trump saw them coming, and his speech reflected that recognition. He trolled them relentlessly, putting them on the spot offering those applause lines they wouldn’t applaud – and then, in a master stroke, he touted the success of women in the workplace and the unprecedented numbers of females in Congress. Upon those lines they rushed to their feet and burst in applause, giving the unavoidable impression that all they really cared about was themselves. When record-low unemployment has you sitting on your hands but record female membership in Congress has you high-fiving like it’s a basketball game, America has little choice but to believe you’re in it for yourself and no one else. This can’t have gone unforeseen by Trump’s speechwriters. It was military-grade trolling – and he repeated it again and again. The best moment of the speech, of course, was when Trump resolved that America would never be a socialist country – a direct affront to Bernie Sanders and Alexandria Ocasio Cortez which had both of them glowering at him as most of the hall loudly cheered. That line could be interpreted as an olive branch to Nancy Pelosi, who rudely shuffled papers from behind Trump on the podium as she chewed on the inside of her cheeks during the speech – Pelosi is under pressure from the increasingly Hard Left faction in her party which she at one time was on the vanguard of which but has now thoroughly eclipsed her, and the adult Democrats are terrified at what the new radicals will wreak upon them when the 2020 election rolls around. The speech played as though Trump’s team knew Pelosi’s approval ratings are far below his, and if he was able to smoke out how radical his Democrat opposition actually is he would seize the political upper hand. He accomplished that, and now controls the political moment. Advantage Trump.